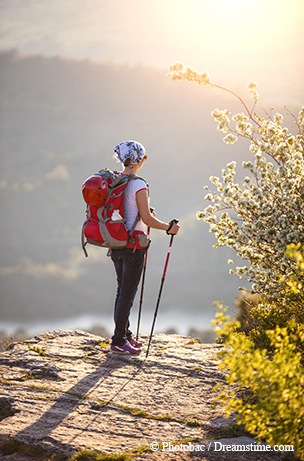 Hiking staffs and trekking poles keep you steady and strong on the trail. Think walking sticks are just for old guys who can’t make it up the hill? Think again. There’s a growing use of poles, sticks and staffs among day hikers and long-distance trekkers who love to hit the trails at Texas state parks. Sure, old knees appreciate any help they can get, but using a pole or two can also help anyone keep their balance when crossing a stream, traversing a hillside, coming down a slope topped with scree or carrying heavy loads. In addition, poles can prolong the life of your legs, feet and especially knees. These parts aren’t easy to replace. Two poles or one? While they do tie up both hands, using two poles offers greater balance, allowing you to use your whole body while hiking. One pole can throw your body off, creating torque in your spine. Going downhill with two poles, you can use your upper body muscles for better posture and power. A single hiking staff is best used on flat terrain with little or no load. Walking staffs are single poles that come in a wide variety of styles. My husband carved his simple cane out of a forked tree branch, adding a rubber tip to the bottom for stability. Staffs come in solid wood or lightweight aluminum; some are made from rare wood or sport fancy handles. Some even fold up for convenience. Most come with a handle or leather loop for your wrist. Sticks range in size from approximately 40 to 60 inches, so buy one that works with your height. Shock-absorbing poles: Internal springs absorb the shock, though you can turn this off when you don’t need it. If you have weak ankles, knees or hips, these may be worth the extra cost. Ultralight: Less weight makes ultralights easier to pack and quicker to use, leading to less fatigue. The material used (aluminum or carbon fiber) determines the weight; ultralights generally weigh less than a pound per pair. Camera mount: Poles also come in handy when you come across that great landscape or wildlife shot. Some poles and staffs have a built-in camera mount, so you can use it as a monopod for your camera. Even after you decide between one staff or two poles, there’s more to learn. Locking mechanisms secure the poles at your desired length and keep them from slipping. Choose from external lever locks, push-button locks, twist locks or combination locks. Grip materials include cork (resists moisture), foam (soft, absorbent) and rubber (insulates from the cold). Pole tips come in carbide or steel. Rubber tip protectors take care of your gear as well as the ground you traverse.